Here's a picture book that's absolutely perfect for reading aloud to preschoolers, particularly ones young enough to still like kisses. This scenario repeats with a variety of sea creatures, when along comes a girl fish who shows him that puckered lips have a much better use than pouting! So the book finishes up with our friend singing his song in a modified version, now declaring himself a kiss-kiss fish. 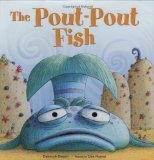 I read this book at a storytime with very young preschoolers, and got them making pouty faces and singing the fish's song along with me. We all had a delightful time. This wonderful book is delightfully silly and naturally interactive. A fantastic Storytime stand-by.